Chunky necklaces are a great way to spice up any minimal outfit! If your style tends to sway towards dainty, delicate pieces, a chunky necklace is a great way to change up your jewelry game. It doesn’t hurt to add a pop of color or texture every now and then. A chunky necklace will automatically make your outfit look trendy, chic, and fashionable. Transform your plain outfit into a top fashionista look! Keeping your look basic while adding some unexpected accents is always fun! The best way to upgrade your fashion style is with the right necklace. Your accessories are the most important part when revamping your outfit. Pile on your costume jewelry and thrift finds cause here we go! 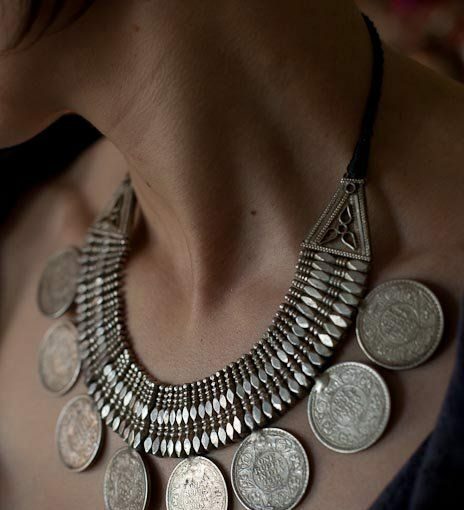 Coin necklaces are the latest hit – and we are loving it! The antique feel mixed with a modern chunky twist is memorable and stylish. 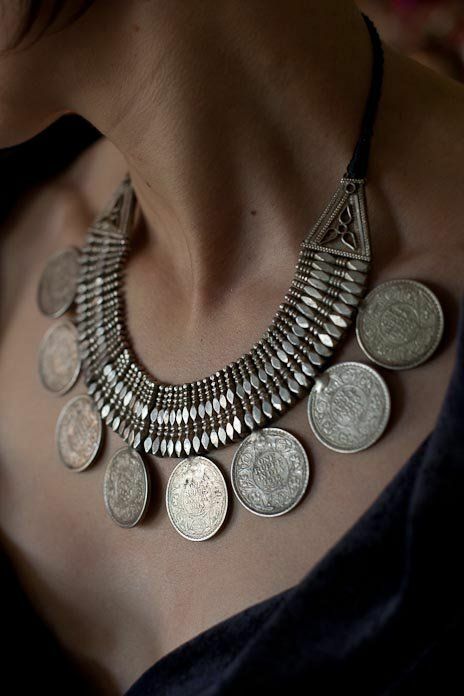 Pair multiple coin necklaces for a chunky look or settle for a bib coin necklace with coins punctuating the neckline. It is most important to keep all other jewelry pieces to a solid minimum when wearing a chunky necklace. Put away those bangles and gaudy rings. And you can forget about those statement earrings too! Your outfit will look messy and distracting with too many bold pieces going on at once. Try a simple gold band ring or a subtle chain bracelet instead. A pair of minimal stud earrings are fine but try not to wear these pieces all at once! When wearing a chunky necklace, we recommend wearing one other subtle piece. Wood jewelry is so chic and edgy. Its eco-friendliness is making it an upcoming trend. As more people are becoming aware of the effects on our environment, more actions are being taken to live sustainably. Why not also let these efforts show in jewelry choices? Don’t settle for cheap, plastic pieces. Classic, hand-made wooden jewelry contains more quality and adds a special touch to your look. You can wear it knowing it is made with high quality and care (depending where you purchase it from). The earthy look of a wooden chunky necklace will complement well with light or neutral colors. Pair with a white button-down shirt, denim jeans, and some stylish booties. If you’re having a hard time finding a piece that is right for you or are on a strict budget, try a DIY! This is a great alternative when you want to mix up your style but just don’t want to spend hundreds of dollars to look stylish! Don’t be intimidated by big and bold necklaces! They are crucial in creating that summery feel. Sit by the pool, grab a mixed drink and read on for your summer necklace tips. It is important to keep your outfit simple when rocking a bold chunky necklace – we cannot stress this enough! Style a colorful geometric bib necklace with a flowy chambray dress and flat white mules for the ultimate summer-ready look. If you’re attending a corporate event or heading on your daily commute to work, you can always style a chunky necklace that suits you. Look professional with a collared shirt buttoned all the way up. Layer your favorite colorful necklace right under the color. This will allow the necklace to pop from underneath. This creates a stylish, comfortable look if you prefer not to have your chunky necklace directly on your neck. Try using various bold colors for your look. Pair a pink top and white ripped jeans with a baby blue beaded chunky necklace! You will look like a styling pro with your chunky piece! Colors are what summer is all about. You will appreciate this stylish and inspiring look. Why not give it a shot?